Camel Cigarettes Online for Australian customers! This brand was created by RJ Reynolds Tobacco in 1913 and is considered to be one of the oldest existing brands of cigarettes in the international tobacco industry. Camel Cigarettes are manufactured from the best sorts of Virginia and Turkish tobacco, and was one of the first products offered in packs. The aroma of Turkish tobacco used in Camel cigarettes becomes very intense and pleasant when burned. The smoke is darker and browner as compared to other cigarettes, which gives them a savory smell. The main manufacturer and distributor of Camel cigarettes is JT International. It needs to be mentioned that the tobacco blend of Camel cigarettes didn't suffer any changes since its appearance on the market, which was about 100 years ago. Camel is so appreciated by people world-wide due to their great combination of excellent quality tobacco and the product's affordable price. These cigarettes became a long lasting trend for inveterate smokers, mainly because of their smooth taste and well-balanced nicotine content. 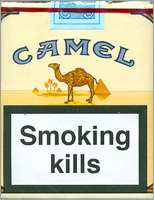 Camel cigarettes are sold in over 90 countries and is known as one of top five global cigarette brands!